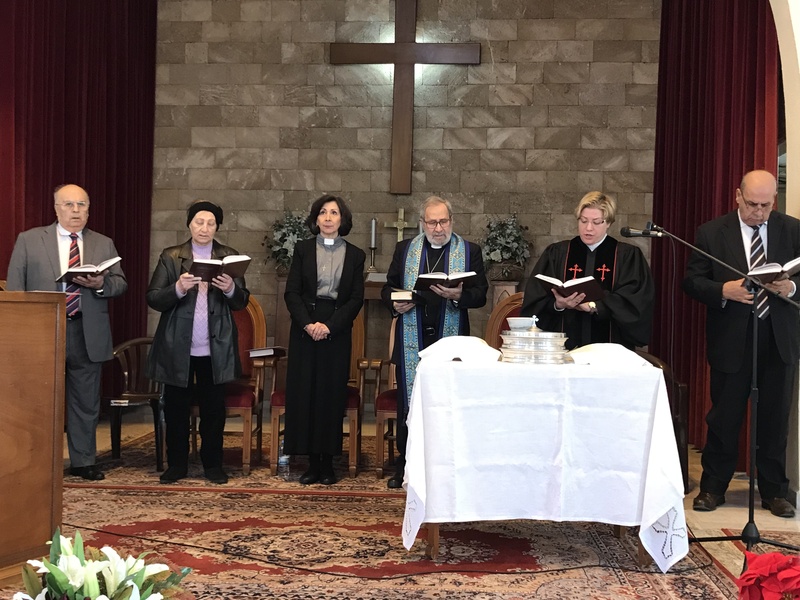 A service of Holy Communion in Tripoli, Lebanon, January, 2018. Because we are the crowd. We yell like that all the time when we choose to not see Jesus in the homeless man: Get off the sidewalk! Quit panhandling! Vah! Or in the grieving high school students whose friends have bled out in front of them: Don’t walk out of class! You are too young to preach about gun control! Vah! Or in those seeking refuge from war and poverty: We don’t want you here! You’re not like US! Vah! All over the world his actions are repeated in churches big and small. And we remember that it is Jesus who invites the broken, sinful, vah-spewing mob to his table of forgiveness. May we be taken and blessed and broken and given in his name and in his memory to love like he showed us to love. This is my prayer for Holy Week. They’ve gathered by the hundreds and thousands and the hundred thousands today all over the country to say, “Never more!” Enough young lives and old lives have been taken in horrible events across this land. On another day, I would have stood there with them. But today marks five years. March 24, 2013, my brothers and sisters lost one of us in a way no family should. Our baby sister, Cathy, who should be living life as the 53-year old she would have turned last December 7, was taken by a stranger who sits locked up in Riverside, California. So we gathered today to remember Cathy. 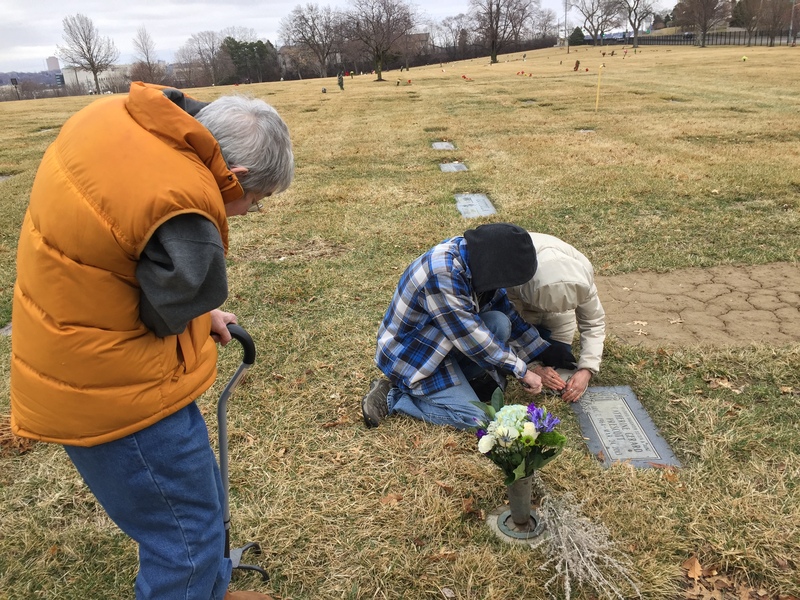 To put purple flowers and dried Russian sage in the vase in Calvary Cemetery that is centered between her marker and the marker of our mom who left us March 27, 1966, not yet 34 years old. Mike and Barb burned some sage and offered beautiful words as the scent ascended among us. As for me, in the quiet of my heart, I heard these words: Dona eis requiem sempiternam…give them eternal rest. Mike and Barb light the sage as Jana watches. 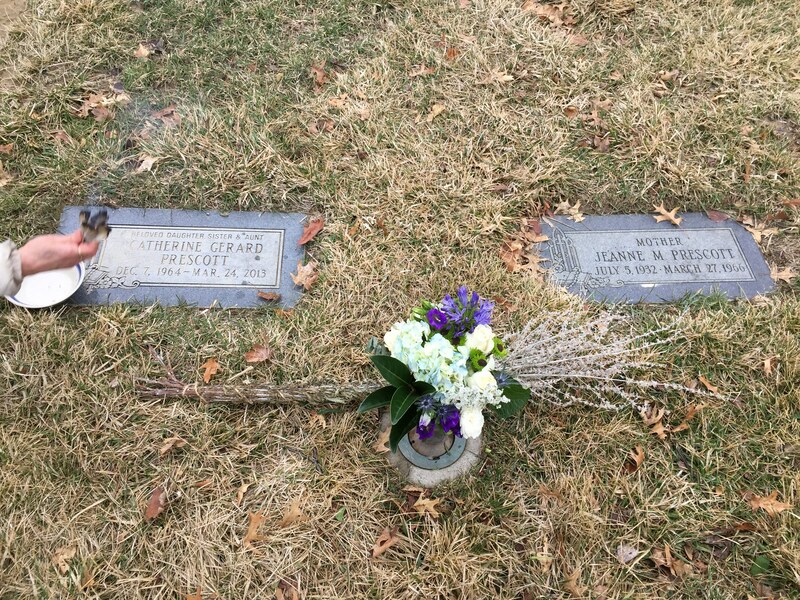 Cathy and Mommy are not in this place where the markers are set and the flowers are laid and the sage has been burned, but this is where we gather to mark the day. We gathered by the ones, remembering the ones we love. But there she was, our Cathy. Like steps in a flight of stairs. The “good one,” it is true! We never called her Sue. With blue eyes and curly head. Her life would be so hard. But especially so for her. To find the ties maternal. As she’s gone to life eternal. That she’ll never feel another. There is peace that she has found. Is to hold her memory dear.